Cellular bonding is a way of combining multiple wi-fi and ethernet signals into one robust connection. We now include that in all our live streams. “Covering live news events via traditional SNG technologies has been an expensive and logistically difficult business. However, with the advent of cellular bonding technology, broadcasters and online video professionals can easily and cost-effectively report live from any location using a field-proven method. Bonding combines multiple cellular and wireless networks — such as 2.5G, 3G, 4G LTE, Wi-Fi and WiMAX — to obtain a reliable, robust video uplink capable of transmitting HD video. A high-quality video experience relies on smooth and uninterrupted video delivery, but cellular links are inherently unstable and fluctuate continuously. Transmitting video over such a link may result in black screens, video breaks, pixelization, jitters, audio problems, lost lip syncs etc., even from a stationary location over 4G. Parameters that affect the experience, such as bandwidth availability, latency, loss rate or all of them together, can change in a millisecond. Therefore, there’s an inherent gap between the desired experience of high-quality video and cellular technology. Cellular bonding has proven to bridge this gap. 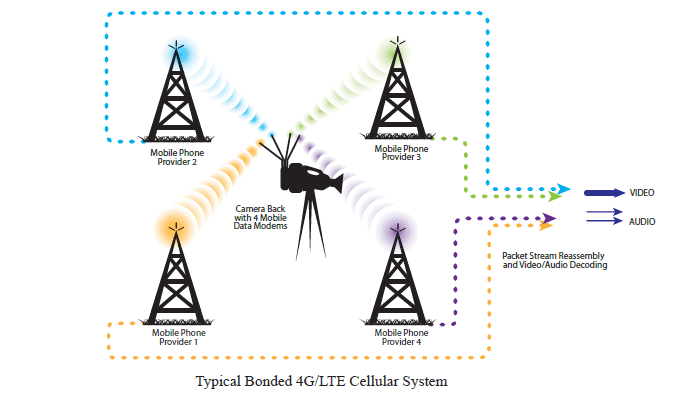 Cellular bonding takes compressed video (H.264) and transmits some of the packets over each of the multiple cellular modems. Instead of relying on a single unreliable link with a single point of failure, bonding several cellular links together minimizes the inherent risks while achieving the desired or greater performance.